To give honour where honour is due, let's start with the oldest member of our collections. Of all the plants at the Montréal Botanical Garden, the oldest is thought to be this lovely silver maple (Acer saccharinum) that stands at the entrance to the Alpine Garden. Even though it can be seen from afar, towering above its surroundings from its height of nearly 30 metres, many people probably don't even notice it. There is nothing regal about its location: set against a chainlink fence, somewhat out of the way, there is no sign indicating that it is the oldest tree in the Botanical Garden. As far as I know, no one has ever taken a core from this tree to determine its exact age. But judging by its diameter of over 1.6 m, it is probably about 125 years old! That's about how old Marie-Victorin (1885-1944) would be today if he were still with us. Our silvery monarch unfortunately had a serious accident during the ice storm in 1998, when it lost close to one-third of its crown. It has recovered fairly well, but its crown is still a bit ragged. Since I'm talking about large specimens, I mustn't forget these magnificent eastern cottonwoods (Populus deltoides) across from the Rose Garden. These three specimens, with their impressive height and girth, also sprang up here all by themselves before the Garden was created. They are thought to be over 90 years old. 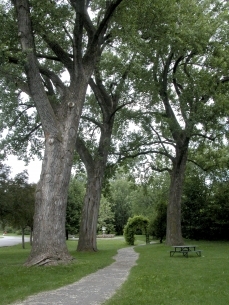 In Quebec, eastern cottonwoods are the trees that reach the largest size. The ones at the Garden are close to 30 metres high, and their trunks are nearly 1.45 m across. These trees don't normally live very long, meaning that the ones at the Garden are already quite advanced in age and rather fragile. Every year, high winds wreak havoc in their crowns. The terminal branches crash together, like the masts of boats in a harbour during a hurricane, and suddenly the ground is littered with hundreds of branches of all sizes dropping from the sky. I'm always worried when the wind picks up at the Garden. "I hope those trees hold up and no one takes shelter under them," I think.